On Wednesday, March 29th, 2017, KPPI team cooperated with GKMI (Maranatha Christian Church of Indonesia) Elshaddai Jelambar who is pastored by Rev. John. At 6.00 PM the prayer team had already started to pray for the continuity of the event and so that God worked at KPPI that evening, even the sick and souls had began to arrive, filled every empty seat with joyful faces to be able to witness the goodness and miracles of God happened at KPPI. The service was started at 7.00 PM opened by Rev. 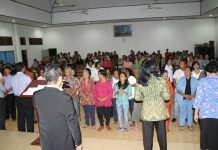 Simson H.P Simanjuntak, praise was raised with joy and zeal, all the congregations so delighted in the house of the Lord and they could praise God. The Lord was present on the praises of His people. Followed then by a film of healing testimony from Mrs. Deliana Sembiring who had a pain on her right hand because of accident in early 2012. The congregations saw this healing testimony film seriously. Later on God’s Word to be delivered by Rev. Lukas taken from Isaiah 53: 2-5 For he shall grow up before him as a tender plant, and as a root out of a dry ground: he hath no form nor comeliness; and when we shall see him, there is no beauty that we should desire him. God was sinless but He wanted to die for each sin of our sins, this Word explains about God’s goodness for us as sinful humans, He who bore every sin even our sickness, He was humiliated for us. Do we say in our hearts: God, You are good? God is always there for us. God loves us so much. The servant of God also invited them to believe and accept Jesus as Lord and Savior, in which 34 souls earnestly raised their hands and said with their mouths, that they accepted Jesus as the Lord and Savior. Furthermore, the Word of God was delivered by Mr. Tony Chandra from John 5:1-9. Jesus healed a man who had 38-year paralysis in the pool of Bethesda. There is no coincidence in God, God has a plan. Any problem and pain which we experience, if we want to come and ask to God then nothing is impossible, God will heal and help us. Whole of them were requested to believe and call upon the Lord. The counselors were asked to come forward first and then followed by the sick. The prayer of healing was raised by Rev. Slamet and Rev. Fairy. Jesus worked and performed His miracles and the healing took place. A man who had pain on the right foot since cholesterol and diabetes was healed. A man whose neck was painful and had cholesterol, God recovered. A man who had headache for a long time and often got dizzy, God cured. A woman who suffered from chest pain was healed. A woman who had cataract and vertigo, her eyes were white like clouds, was cured by God. Blessed be the name of the Lord! Subsequently continued with the God’s servant challenge by Mr. Roland, for those who yearned to serve the Lord came forward to be prayed and 11 souls went forward and gave their lives to serve the Lord. What a wonderful work and great love of God visiting and healing every sick through KPPI that evening! Hallelujah! Mr. Kosmen, recovered from cholesterol, diabetes, and gout for 4 months. Previously known from the lab result cholesterol 200, blood sugar 200, and uric acid 8.4. He felt his right leg felt stiff and his neck was painful. This man got information about KPPI event when he attended the Sunday service at his church. When he was being prayed by the counselor, he felt there was a flow of electricity flowing in his body and Praise God instantly the pain disappeared. His right leg and neck do not painful anymore. Mrs. Therese Sandjaja (69), cured from cataract in both eyes for 2 years. Her right eye had been operated at JEC, but she still felt uncomfortable, opaque, and glare so she was not able to see the light, and she had to wear black glasses if she wanted to walk out, then her eyes were also watery when talking or dealing with others like crying. Her right eye became more uncomfortable compared to her left eye that had not been operated on. She remained check up to the doctor but the doctor said her right eye was fine. She knew about this KPPI event when she attended GKMI weekly service. Upon hearing this event she believed that this was an invitation from God. She believed God would heal her eyes. While being prayed, she felt God had touched her. She could feel the change. First, when she was prayed her left eye was feeling better. She could see clearly, not glare and felt better. Then counselor prayed for her again, Praise God the right eye touched by God as well. She could see clearly, her eye was not glare anymore when she saw the light and was no longer watery.